Wow, what a wonderful few days, the sun has been shinning and it is really starting to feel like summer is on its way. I have been looking at new recipes (nothing new there) and decided that it needed to be salmon, I do love the wonderful pink shades of fresh salmon, a lovely summer dish and this one is ideal as a mid week dinner or it is elegant enough for a dinner party. 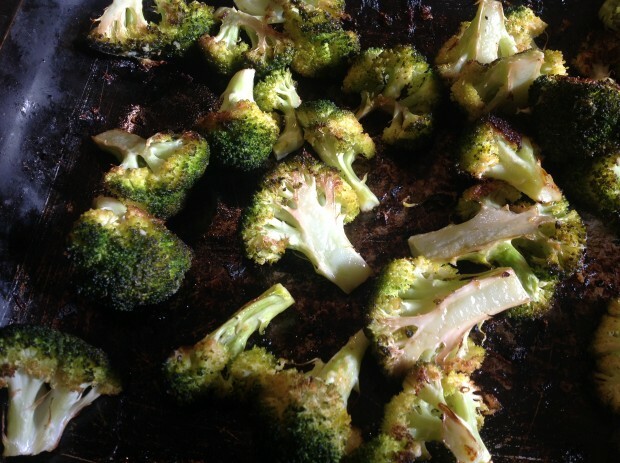 Once you have tasted the roasted broccoli, you won’t cook broccoli any other way. When we find salmon, either fillets or whole, then its a must for me, so hopefully you will enjoy this recipe/meal as much as we did. This meal is cooked in 30 minutes, it takes a little preparation, but probably about 10 minutes, so a great one for a mid-week meal, we thoroughly enjoyed this dish, I know it will be on the menu again next week without a doubt. I prepared the broccoli but cutting off the main stock and cut the florets into smallish pieces, and then tipped them into an oven tray, then poured over the olive oil, lemon and garlic mixture over the broccoli, mix them all together to make sure they are well covered in the oil mixture and then I place in the pre-heated oven (240c), I like to use a very hot oven, so you can get the charred edges, there is just something that this type of cooking adds to the broccoli, it reminds me of the crispy seaweed you can get from the Chinese takeaway restaurants in Scotland. (I digress) Anyway the flavour is just fantastic. 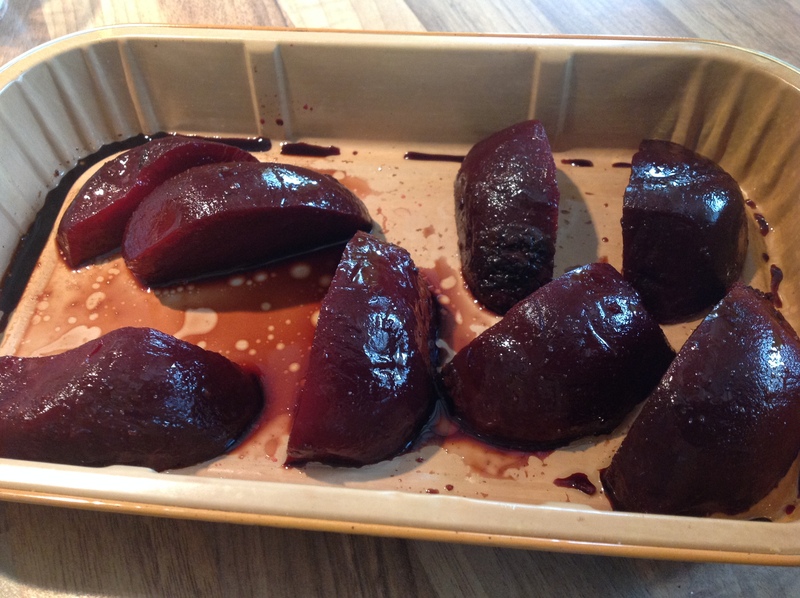 Then I took the beetroot, I used 2 medium beetroots from a vacuum pack, they are already cooked, so it is again the charring that makes all the different to the beetroot. I cut each beetroot into quarters and placed into an oven proof dish and drizzled over the olive oil and balsamic vinegar. Popped them into the oven with the broccoli and then it was time to get the salmon fillets ready. I placed the salmon fillets into a microwave dish, yes a microwave dish, this is the easiest and best way to cook Salmon, it takes no time at all, and they are cooked and still moist and delicious. Cooking the salmon this way, reduces the fishy smell in the kitchen, there are lots of ways to cook the salmon, but this is my favourite. So back to the salmon fillets, as I said, place them into a microwave dish, and top with the pesto, then cover with some cling film (plastic wrap), ready to be cooked when the vegetables are ready. After the vegetables have been in the oven for 15 minutes, remove them and turn over so you can get the charring on all sides, place the trays back into the oven and cook for a further 15 minutes. When the vegetables are cooked, remove them from the oven and place the salmon fillets into the microwave and cook on full for 2.5 minutes. Remove the salmon from the microwave and leave for 1 minute will your place the vegetables on your plates. 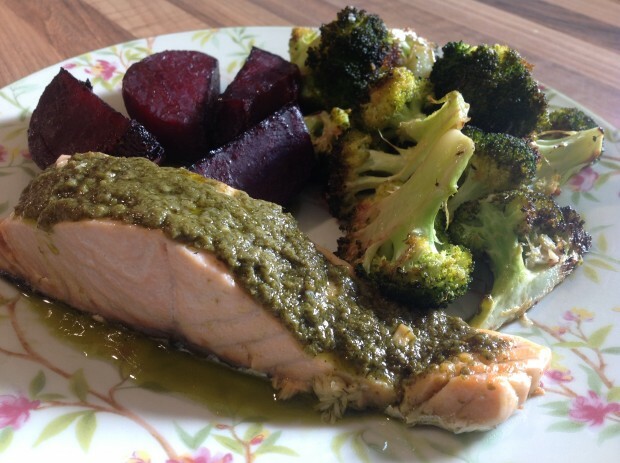 Transfer the broccoli and beetroot to your plates and then the salmon. Again, this is a fantastic dish, I hope you enjoy it as much as we did. 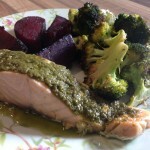 Delicious pesto topped salmon fillets served with roasted broccoli and beetroot, a wonderful mid-week dinner and elegant enough for a dinner party. Once you have tried the roasted broccoli, you will not eat it any other way. Pour the olive oil into a small bowl, add the crushed garlic and the zest and juice of the lemon, add a pinch of salt, mix together. Take the broccoli and break into the florets, cutting off the thick stocks. 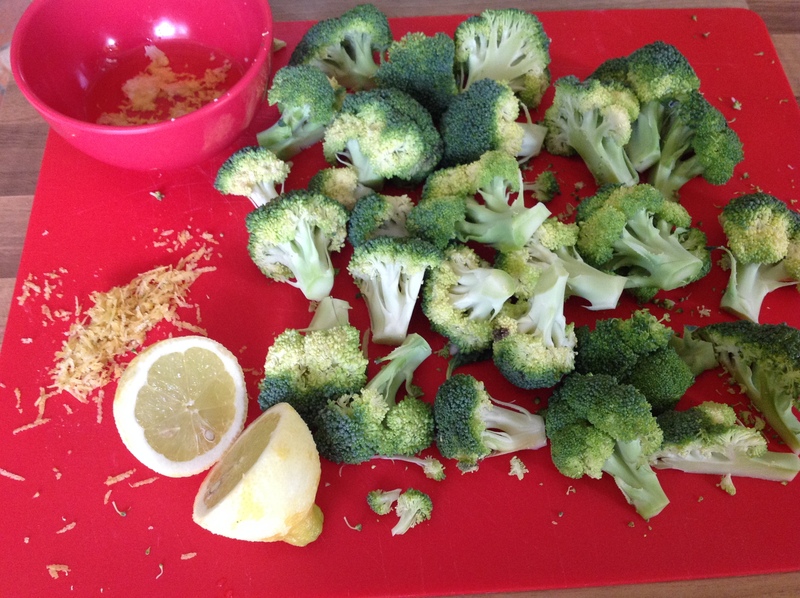 Transfer the broccoli to a baking tray and pour over the oil mixture, using 2 spoons, turn the broccoli around in the dressing to ensure it is well covered. Place in the oven and cook for 15 minutes. Remove the broccoli from the oven and turn over the florets, and place back in the oven for another 15 minutes, until the florets are charred on all sides. Cut the beetroot into wedges and place into an oven proof dish, drizzle over the olive oil and balsamic vinegar, and place in the oven for 25 minutes, remove after 10 minutes and turn over, then return to the oven for the remaining 15 minutes. 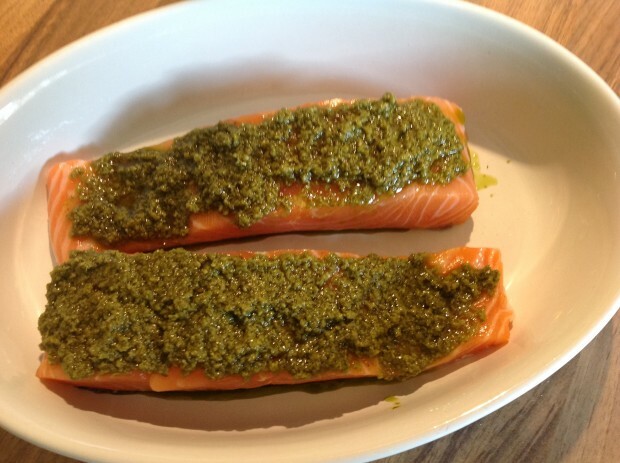 Place the salmon fillets into a microwave dish, spread the top with the pesto and cover the dish with cling film, once the broccoli and beetroot is ready. Place the salmon into the microwave and cook on full for 2 minutes. Transfer the roasted broccoli and beetroot to the plate and then the salmon. Enjoy. I usually serve 150 - 200 grams of salmon per person. Sounds like a lovely and rich recipe for the salmon lovers of the world. Personally I don’t eat any seafood or fish, but love to hear about your wonderful combination of colours and tastes. This looks divine. I love salmon! LOVE it. I will definitely be adding this recipe to my list as the hubs and I are long overdue for a wonderful cooking night in! This looks delicious! I’m adding it to my recipe file. This is divine. I love salmon and this recipe looks simple enough for a non-continental cook to try out. Merci beaucoup! wow! I just had broccoli this evening, I wish I had read this post sooner! Beets are one of my favorite veggies, and I have not thought of cooking them this way, very interesting indeed. This looks delicious. I love beets, and the color combination is lovely. I rarely eat fish, but when I do it is salmon. I have been thinking lately that I need to add more fish to our meals, so will try this out. Thank you! Great recipe! I love pesto on salmon. We usually steam our broccoli but this looks like a good alternative. Interested to taste the flavor brings out!